Working within the bounds of the document, I’m not sure how to answer this, for so far, as several of the previous posts have made plain, I’ve only found undefined terms with no plainly stated criteria to adjudicate, say, a fair from an unfair interpretation. Which is pretty ironic, as I’ve also said already, for here we have a statement on research responsibilities that fails to define any of its own technical terms or make its own presuppositions explicit… So, much like the eventual downfall of the positivists’ verificationalist criterion, I’m not sure this document lives up to its own ambitions. And now, halfway into it, we find a bullet point that cites the document itself as providing clarification on one of the most foundation issues of our entire field. But it turns out to be rather Kafkaesque, if you think about it, because we here have a document that justifies a stance on a crucial issue by citing things it doesn’t actually say. But bracketing all that…, if you “acknowledge” this bullet’s point, i.e., that “responsible scholarship” takes place in and outside of religious institutions (for that’s what they imply by “communities of belief and practice,” right? Curiously, they seem to be looking here for a synonym for “religion,” which aptly represents the effect critiques of the category religion have had: you talk about the same old things but with a new name, thereby creating the impression that critiques of the category religion have sunk in), then the “within and outside” phrasing will start to be seen as rather outdated, for (or so this position might argue) such a description unproductively distinguishes what, presumably, ought simply to be unified and just called “reflection on religion” or, maybe seeing it all to constitute “the field of religion” — as it was termed right from the start. 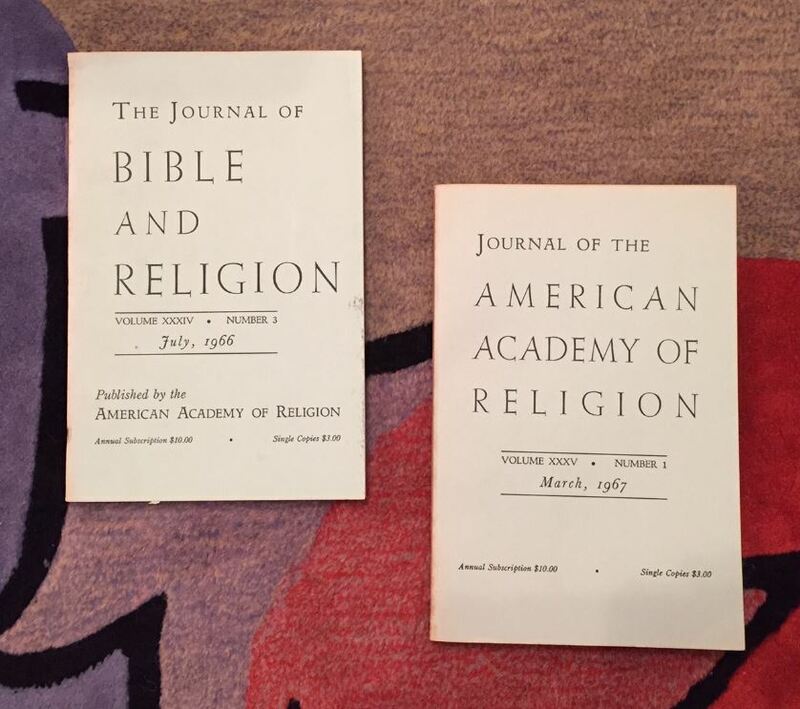 How little the journal had then changed, despite the new name, is pretty apparent from the opening photo, above (note that the journal took a couple years to change title once NABI was reinvented as the AAR). The cover didn’t change until 1970 (vol. 38) — an issue with a table of contents not so different from its predecessors, though the focus is a little larger than just the study of the bible — a little — at least in the articles, if not the book reviews. 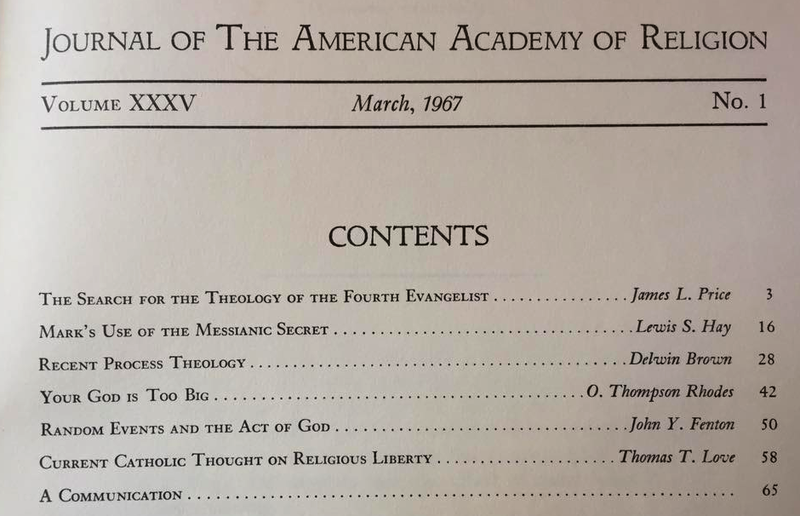 So, the institutional history of the AAR predetermined that it needed a big tent rationale and rhetoric right form the start — given that social science and humanities interlopers (my word, I know) were late to the game of studying religion in a way not necessarily affiliated with some other pre-existent academic discipline (i.e., seeing oneself primarily as an anthropologist who studied the anthropology of religion or a sociologist who studied its sociology). But despite this attempt, right from the start, to come up with a way to portray the field as uniform, fracture points have always been apparent. 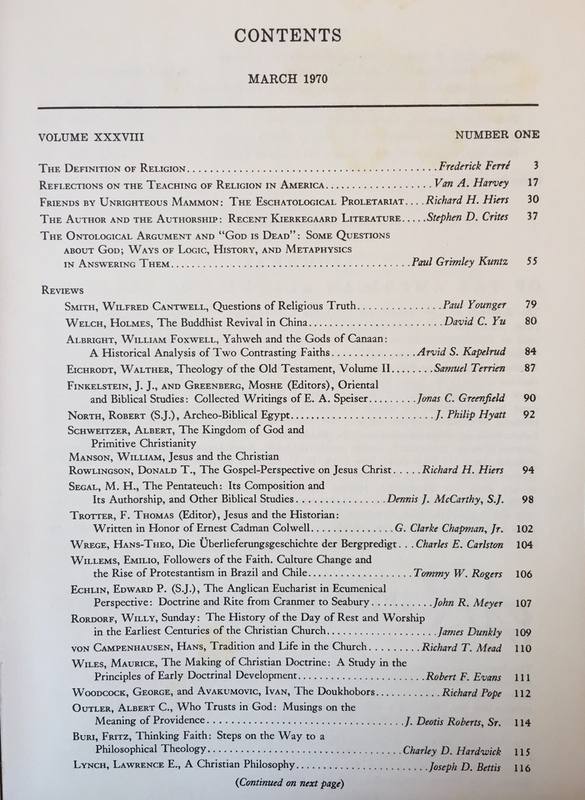 Case in point: the distance between Frederick Ferré‘s article in that 1970 issue cited immediately above, concerned with a technical discussion of definitions of religion (“Definitions are tools for bringing order…” [p. 5]), on the one hand, and Paul Grimley Kuntz‘s essay that tries to revive natural theology in the face of the death of god movement at the time, on the other, is not just represented by the intervening pages in that issue — that they’re even in the same journal is the problem, from where I sit. Or consider the very fact that the above-quoted bullet point from the draft document asserts that the two otherwise distinguishable approaches are complementary — not something you’d worry about claiming if they actually were (doth protest too much, and all that…). The attempt to manage the contest makes the contest all the more apparent. So the draft document, or even a perusal of the the pages of a current issues of JAAR, suggests to me that not all that much has really changed since those early days. Sure, the explicit theology might be at a minimum (though, certainly, it’s not absent), but we still have our share of articles concerned with sorting out all kinds of other ahistorical topics (e.g., human nature, meaning, experience, etc.). Key, here, is that so-called religious experience, which inhabits our “inner life,” is understood to pre-exist empirically observable and thus historical action, i.e., it is enacted, much as many today might say it is embodied. (Question: what, other than bodies, are we?) 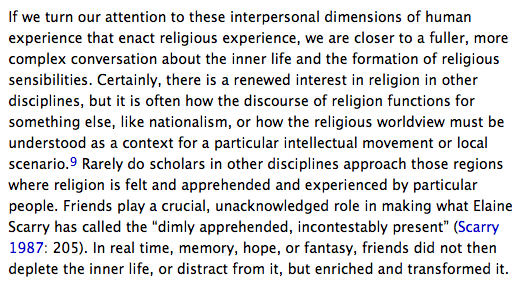 Also important to notice is the old argument — one that was used in the 1960s to establish autonomous Department of Religious Studies in the US — about how our field is set apart from others that study religion, inasmuch as we (or so this old nugget goes), unlike others who only study its effects, study it for what it is (i.e., as phrased above, scholars in other fields study how it is used, not what it is like to experience it). In surprising ways (or should I write unsurprising? ), the assumptions that drive such an article would be very much at home in the journal half a century ago (though this is hardly the only way that, for example, scholars might now talk about experience, as Craig Martin and I tried to make evident in an anthology that we co-edited a couple years ago; in fact, this article itself would constitute a piece of data for the approach I’d advocate). So, like I said above, the virtually identical journal covers, early on, sends a message — one that, in my reading, the journal as well as the committee’s draft document reinforces today. 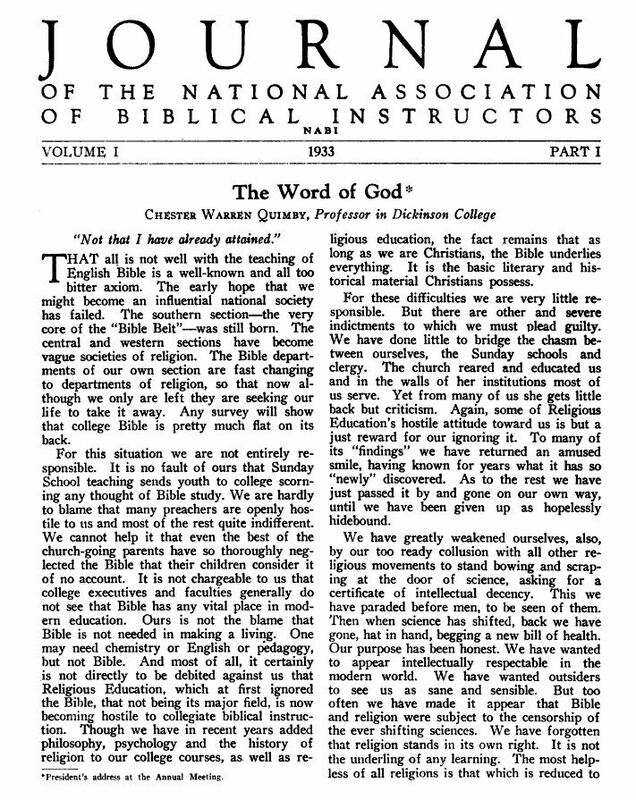 That our late-19th century intellectual predecessors saw a bright line demarcating different ways of talking about religion meant that, come the invention of the AAR, there was a need, from the outset, to develop a rhetorical way to contain them all within the one big tent, and “total complex of disciplines” was then used, along with the cross-disciplinary conception of the field, never wanting to get too deep into what counts as a legitimate academic discipline, of course. For when we do we find differences between “within and outside” that are significant enough to make the former the object of study for the latter, making them hardly complementary approaches. So depending on how you define the limits of this field — and even the most inclusive sorts would, presumably, agree that not every seemingly rigorous claim about religion counts as legitimately representing the sort of work that we should call scholarship, right? Remember that word “may” in the bullet point…. — simply calling it all “the field of religion,” as they did 50 years ago, or naming it all as “reflection upon and understanding of religious traditions, issues, questions, and values” (which happens to be phrase used in the AAR’s mission statement), is not sufficient to hide the contradictions contained at the heart of the apparently collective enterprise. For, just as at last year’s AAR annual conference in San Diego, where I was (curiously, to me, I admit) invited to be a respondent to a panel working on inter-religious dialogue, the disparity between the two ways of conceiving of the study of religion was profoundly apparent (as evidenced in gaps between some of the panelists, let alone the outright disagreements between myself and some present concerning what the academic study of religion does and does not do — learn more here), this draft document’s assertion concerning the comparability of work carried out “within and outside” is not sufficient to house the differences contained in that poorly designed big tent. Given that many of us feel like we’re doing fieldwork when reading our Academy’s journal or attending its annual meeting, the diversity is just too diverse. 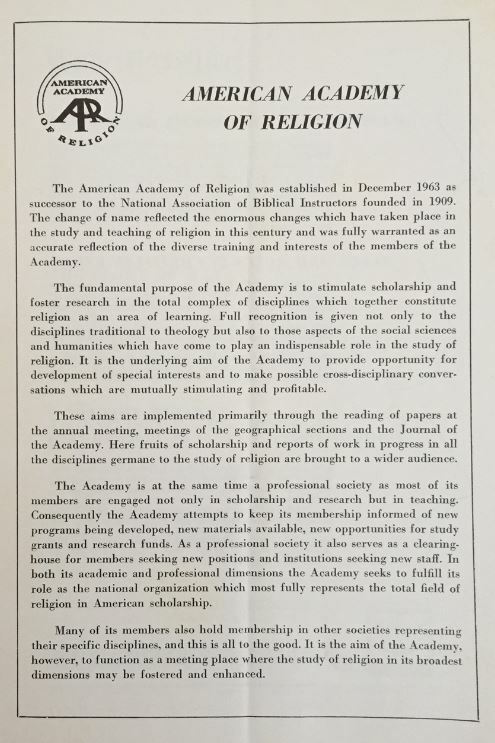 This entry was posted in Faculty Blog, Relevance of Humanities, Religion in Culture and tagged American Academy of Religion, Big Tent, Inter-religious Dialogue, Journal of Bible and Religion, Journal of the American Academy of Religion, National Association of Bible Instructors, Research Responsibility, Theology by Russell McCutcheon. Bookmark the permalink.